Have you ever thought about using promotional gifts as an effective branding tool? A good brand ensures that everyone who sees things related to your business, such as your logo and your product, will immediately associate quality with your business. One idea is to use promotional gifts and a high quality producer of corporate gifts is Etched In Memories®, these gifts will continue the association of your brand with quality! Gifts create goodwill and bring your business closer to your customers. You can win the trust of potential customers because everything you wish to portray about your brand is encapsulated in these promotional gifts. Taking the time to choose something really unique, and to get a creative marketing message across, will help prove to your customers that you can indeed deliver high quality products and services. Etched In Memories® offers a large range of pendant shapes and have engraved many other metal surfaces for businesses, these include: Zippo lighters, watches and business card holders etc. Suitable items need to be perfectly flat, no thicker than 20mm and no wider than 80x80mm. If you have something in mind as a unique corporate gift, that you would like to personalize, our staff are here to discuss the options with you. One of the major advantages of using promotional gifts is that you have a great degree of control over whom you want to send the gifts to. This allows you to choose your target prospects or customers very carefully. A carefully chosen gift from you to your clients will give them something useful to remember you by. For orders required prior to 25 December 2009, please have your order in by Friday 18th December 2009. Late orders may be accepted, and will be processed on a first come first served basis, subject to stock and time availability. For orders received in the last week (19-23 Dec) before Christmas you will need to upgrade to Express Post if you require pre-Christmas Delivery. Please keep in mind that if you reside in Tasmania, Western Australia, Northern Territory, or any other country area that is OUTSIDE of the the Australia Post next day delivery network for parcels dispatched from Sydney, you will need to allow extra time for your Express Post delivery. We will be processing orders right through until close of business on Wednesday 23rd December 2009. Then we will be taking a short break over the Christmas and New Year period from Thursday 24th December and will re-open on Monday 4th January 2010. Orders can still be placed during this time, and will be processed upon our return. For your chance to access our subscriber only special offer, currently available until Father’s Day (Sunday 6th September 2009)! Our newsletter will keep you up to date every few months, with whats happening at Etched In Memories, great articles and more. All you need to do is register NOW and then log in on the night, and you will receive an email with all the details upon registration. We will take you on a personal tour of our new website, show you some of our process and possibilities, plus by attending you will be in the running to win a gorgeous Dichoric glass pendant necklace (donated by Marakye). March last year saw the beginning of our planning for a new logo and website. Our logo was finalised in August, and we began the process of trade marking in September. With our new website far from a reality at that stage, we decided to hold off and launch the 2 together, which we now proudly present. Take a look now or take a guided tour with us at our online event, this Wednesday evening (29 April). We have increased the range of our 9ct gold pendants, now bringing you 3 smaller sized options. The smaller 9ct pendants come in a Heart (22x19mm), Square (20x20mm) and a Circle (20x20mm). In addition to the solid yellow gold that we currently offer, all our pendants are now also available in solid White Gold. As always, if we don’t have what you are looking for, please contact us. As all our premium pendants are made to order, we are more than happy to quote for your requirements! We would just like to thank all our customers, family and friends that voted for us in the local business awards! 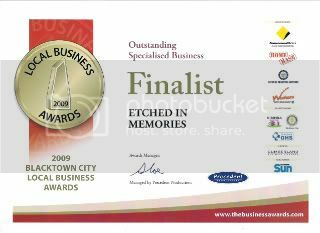 Etched In Memories has been named a finalist in the Awards and we are just thrilled! Are you looking for an I Do this Valentines Day? It’s all about the dress and with Lizie Nellie, Modern fairy godmother, YOU can have the wedding or formal gown of your dreams. You can choose from a soon to be released Limited Edition range of Bridal Gowns, Bridesmaids dresses, Formal/Prom Dresses, First communion gowns and christening gowns/robes. Or…Consult with the designer, Elizabeth Corrigan, to have your own unique handmade gown created to suit your personality. Yes Yes Yes! If this is your Valentine you will need a celebrant. Luckily there is a free celebrant directory where you can quickly and easily find the celebrant to suit you and the occasion. www.needacelebrant.com.au makes the organising easy – search, view and contact online today. Each celebrant’s page has photos and information for you – making it easier to choose. Search by Post Code and find the closest celebrant to you or your venue – a very “green” option. Search by a Region for all the celebrants who perform ceremonies in your area. The helpful articles by wedding professional on www.needacelebrant.com.au provide great ideas and good advice for your wedding day. You will also find the “Frequently Asked Questions” section helpful. Be it a wedding, naming, renewal of vows, commitment or other ceremony www.needacelebrant.com.au has a celebrant for you. PREMIUM PENDANTS: Any 9ct Gold and Sterling Silver orders need to be received by Monday 15th Dec, to allow for our jeweller to hand-make (last minute orders later than that date will be at the discretion of our jeweller). RHODIUM OR IPG PENDANTS/PACKAGES: Ideally all Standard pendant/package orders need to be in by Friday 19th Dec, however, we will be able to process last minute orders, with express post only, on the Monday 22 (last day for WA/TAS/NT/any non-metro areas) and Tuesday 23 (last day for SYD/ACT/BRIS/MELB/ADEL) – subject to availability. Essentially For Women are holding their Business and Life Mastery events in August (in Brisbane, Sydney and Melbourne). Tickets to this event are valued at $495 but as part of their birthday celebrations they are offering them FREE. Events are filling fast so if you are looking for an opportunity to network with amazing women and learn strategies that will set you up to win in business and life you need to register NOW. Simply log onto http://www.essentiallyforwomen.com.au/ticket.html and reserve your seat.